Formed from the movement that secured the right to vote for women, the centerpiece of the League’s efforts remains to expand participation and give a voice to all Americans. We do this at all three levels of government, engaging in both broad educational efforts as well as advocacy. Our issues are grounded in our respected history of making democracy work for all Americans. The League is different from many organizations in that what it accomplishes comes directly from the involvement of its members. It is a grassroots organization providing every member with opportunities to learn and educate others about government, and take action on public policy. We walk our talk: we believe that we need everyone to participate in order for our community to be strong, safe and vibrant. Whether you contribute your time, your money, or both, you can feel confident that your investment in democracy goes further in the League. Groups of League members meet to discuss topics in a respectful setting. They learn effective techniques for public discussion, how to advocate on specific policies, and what the issues beneath the rhetoric are. Our study and consensus process ensures that we are fully informed on issues before we take a stand. We also host public forums and debates, which are well known for being fair, transparent and civil. This approach has earned the League a global reputation for integrity and thoroughness. 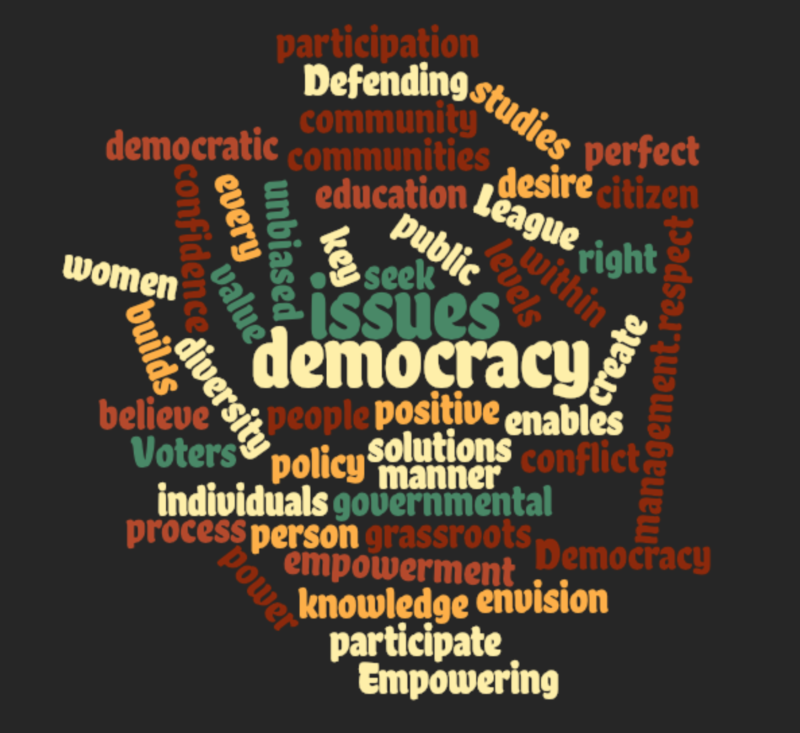 Your participation in the League will expose you to a breadth of experiences and issues that will not only inform you but create greater possibilities for civic engagement than you might imagine. You can spend as much or as little time as you wish. Whether you aspire to leadership or are keen to follow the lead of experienced members, the League will excite, use, and nurture your civic curiosity, ideals, or desire for action. We offer our members webinars, conference calls, workshops, other events and mentorship opportunities throughout the year, at the local, regional, state and national levels. Since its inception, the League has helped millions of women and men become informed participants in government. In fact, the first league convention voted 69 separate items as statements of principle and recommendations for legislation. Among them were protection for women and children, right of working women, food supply and demand, social hygiene, the legal status of women, and American citizenship. The League's first major national legislative success was the passage of the Sheppard-Towner Act providing federal aid for maternal and child care programs. In the 1930's, League members worked successfully for enactment of the Social Security and Food and Drug Acts. Due at least in part to League efforts, legislation passed in 1938 and 1940 removed hundreds of federal jobs from the spoils system and placed them under Civil Service.